I normally pay little attention to the Davis Cup but seen as though this is the first time we've seen Roger on court in a “competitive match” since he lost to Nadal in the Australian Open Semi Final I thought I'd make a brief post. If you haven't seen the result, the tie went down as follows: Wawrinka lost 9-7 in the fifth set to Mardy Fish, Roger lost in 4 sets to John Isner and then Wawrinka and Roger lost in 4 sets to Mike Bryan and Mardy Fish. I didn't see the Fish/Wawrinka match but just by looking at the scoreline it must have been pretty close, I don't know if Stan let Fish back in when he should have won, or Fish was the better player on the day – all I know is that it was a bad start for the Swiss. The match I did see was Roger vs. Isner, which was a slightly disappointing loss seen as though Roger won the first set after playing some good stuff. Roger played an average match from there on in, he dropped the second set, but looked very comfortable on serve and should have wrapped up the 3rd set before losing it in a tie break as he had quite a few break point chances. He then wilted in the fourth and didn't look like getting back into it. From what I've seen on forums, twitter and from reading a couple of articles, the question on most Fed fan's lips seems to be should we read into this match and is it a sign of things to come? Is Roger low on mental toughness? Why does Roger keep losing after winning the first set? Is this loss anything to worry about? Seeing Roger lose is always disappointing, but I can never read into Davis Cup matches too much – for starters you only have to look at how many times over the last 10 years Roger has made himself available for selection, I can tell you, it's not many. So that alone suggests it's not something he takes seriously or places huge emphasis on. 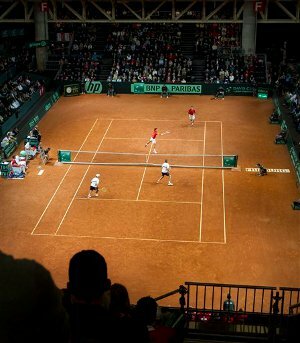 I think this is the case for any of the top men in the game – the Davis Cup is not a sought after trophy to add to a Tennis CV – yeah it's not going to hurt it, but at the same time it's not going to improve it a whole lot. Another thing that leads me to believe that Roger was struggling for motivation in this match was the amount of come on's and fist pumps he was putting out there, it's almost as though he was trying to convince himself, as well as the fans he was genuinely up for the match. I like it when Federer gets into it and gives a big come on, but only when it matters and is a direct result of true emotion – at times in the Davis Cup he was using them for the most routine of points, which in no way were ‘allez!' worthy. In terms of the match itself, Isner served very well, his second serve kicker took off on the clay and was very hard to control on the return (from all reports the surface was crazy bad and didn't bounce true at all). Roger served well as usual, and had quite a lot of chances to break Isner, but the American served big on break points to save them so really it's tough to see what else Fed could have done. You can argue it's worrying Roger won the first set comfortably and then gradually faded as the match wore on, but we have to remember Isner nearly beat Nadal in the first round of the French Open last year, so he's clearly not a total clay mug, coupled with a big serve means matches can slip away from you pretty quickly. I can understand the worries of some Fed fans in the sense that this match followed a similar pattern to several of Roger's recent defeats in Slams, e.g. Djokovic at last years USO semi final and Nadal in this years Aus Open Semi etc, but we have to remember this is Davis Cup – not a Grand Slam. I guess my assessment of this loss is: until Roger starts losing to guys like Isner in the first week of a slam, then I'm not worried. It's still way too early in the season to assess where things are heading. The clay on Roland Garros isn't likely to end with a slam win for Fed, but at Wimbledon I think his season could spark, and come what may, that's going to be the tournament that I judge Roger's season on, and possibly what will happen for the remainder of his career. Next up is Rotterdam, an ATP Masters 500 tournament, it's the first time Roger has played there since winning it in 2005. I think his first round is against Mahut on Wednesday at 7.30pm local time, he should routine that and then who knows. I'll be watching but it's not a tournament I'm getting excited about, to be honest, I think the only reason Roger is playing is to help out the tour – that tournament doesn't attract the top players too often, so with Roger playing, ticket sales are going to be through the roof compared to last year. He's the top seed so he has a chance of winning, but I'm not going to jump to any conclusions if he loses early, I just want to see him try new things, perhaps plays an entire set of serve and volley and see what happens.